Whatever it is we love so much about cranking up the heat on food, we just can’t get enough of hot sauce. Whether for dipping your pizza crust or adding extra flavor to a microwavable dinner, I challenge you to find me one person who hasn’t tried the now-ubiquitous Sriracha hot sauce. We’re all familiar with that proud rooster, the big red bottle, and its green top. 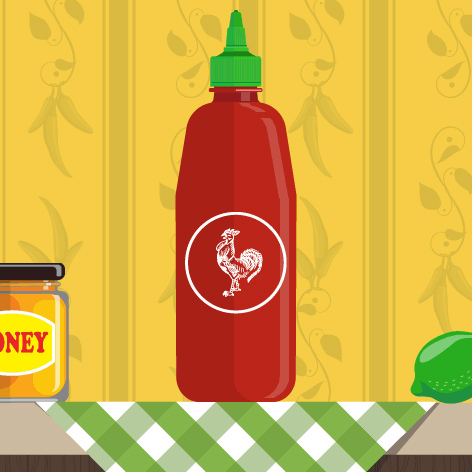 So why is Sriracha so popular? The magical secret to this hot sauce and our obsession with spicy foods is capsaicin, the chemical compound found in chili peppers that creates that burning sensation we crave. But did you know that this sensation of spiciness is actually a form of pain? According to Paul Rozin, a professor of psychology at the University of Pennsylvania, the neurons responsible for processing pleasure and pain lie very close together in the brain and even share several connections. Rozin says our love of heat can be explained by both these centers working together simultaneously. Essentially, our love of spicy foods makes us all a little “benignly masochistic,” he says, a quality that, according to studies so far, seems to be uniquely human.3 Hot sauce sales have skyrocketed in recent years, making it one of the most consumed condiments in the United States. 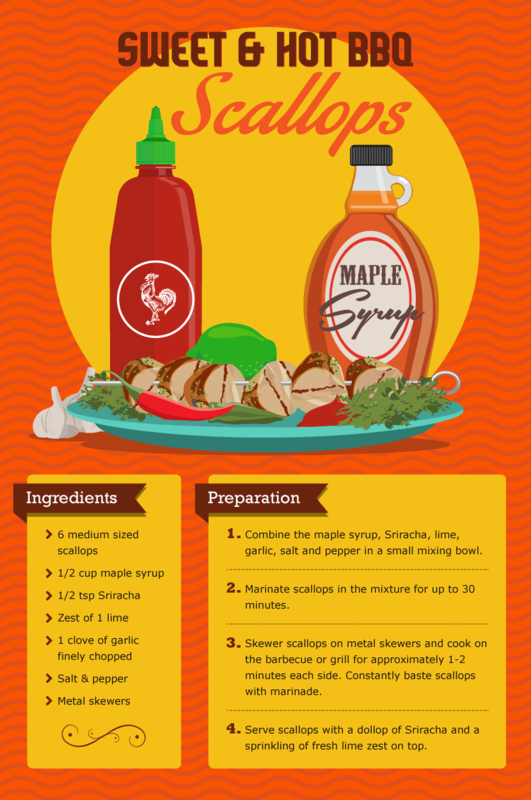 So while we add one more drop of hot sauce to our ketchup, we’ve put together a selection of some of the most interesting and unusual applications of Sriracha. 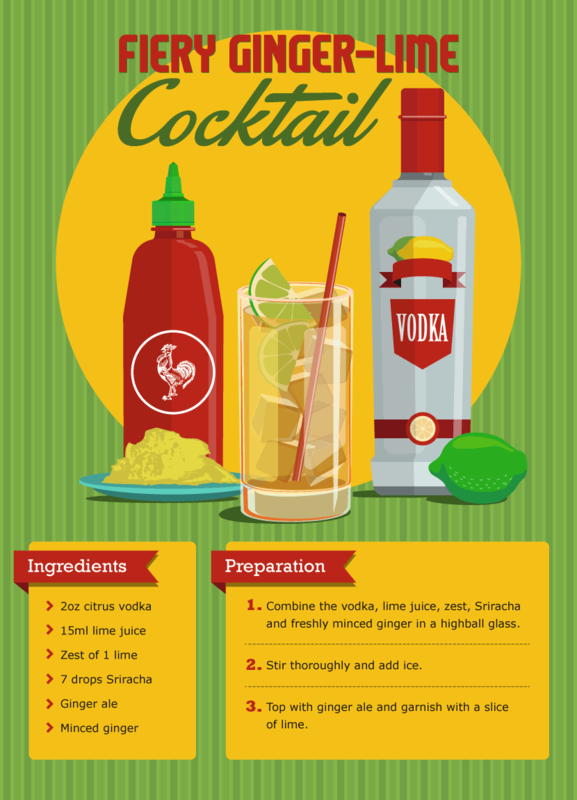 Check out three of the very best heat-inspired Sriracha recipes to spice up your summer. Your new favorite hot-weather cocktail has arrived. Classic refreshing flavors ginger and lime get a modern twist with the addition of Sriracha that lends the perfect final punch to this flavorful cocktail. Pro Tip: Upgrade your ice cube tray to make big spherical cubes, which will take longer to melt so your drink doesn’t get watered down before you’ve had a chance to take a sip! Who doesn’t want to fire up the barbecue for a new take on fresh seafood this summer? The fiery glaze on these scallops delivers just the right amount of kick to wake up your taste buds, and pairs perfectly with sweet barbecued veggies for a light but satisfying meal that’s good enough for entertaining or just for you. Pro Tip: To cook wonderfully tender scallops, start by choosing only the beige- or pink-colored scallops, remember to remove the small, tough muscle attached to the scallop, and cook the scallops on high heat for a short time. This beguiling dessert won best dish on Top Chef DC in Singapore. The combination of sweet and spicy delivers a powerful finish to a really good meal. Pro Tip: To avoid a slippery banana mess, which can happen if your banana is too warm, skewer then freeze your banana medallions ahead of time before brushing with Sriracha and dipping in your batter. 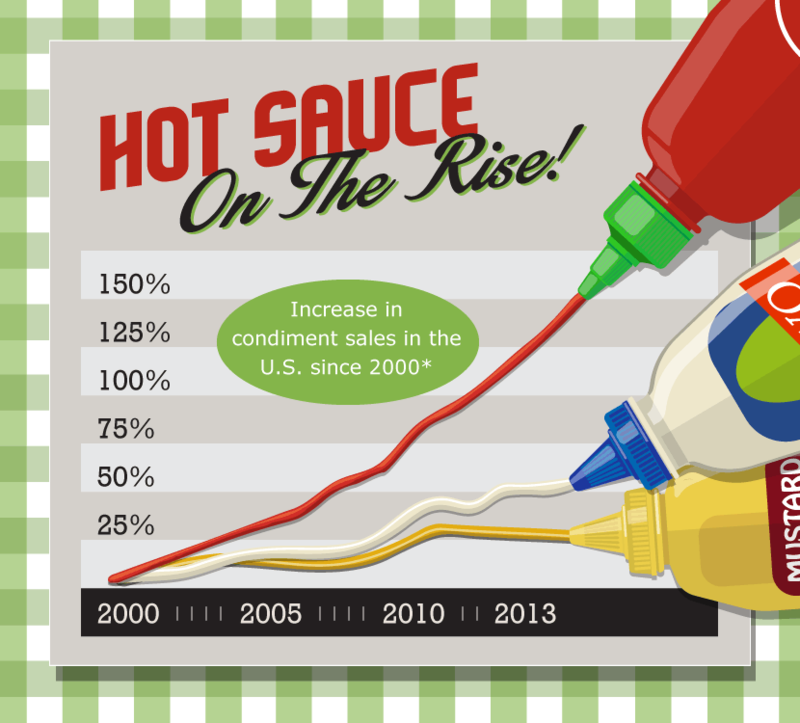 Sriracha: North America’s New Drug of Choice? Science shows that our love of spiciness is somewhat entangled with chemical pleasure reactions in our brains, which suddenly makes Sriracha seem more like an addictive indulgence than a simple hot sauce. Could our psychological obsession with hot sauce explain a rise in popularity of Asian cuisine in North America, particularly the rise in popularity of Thai food, the birthplace of Sriracha hot sauce? With just the right level of heat, Sriracha has charmed a continent, opening up a world of flavors that are likely to ride the popularity wave long into the future.